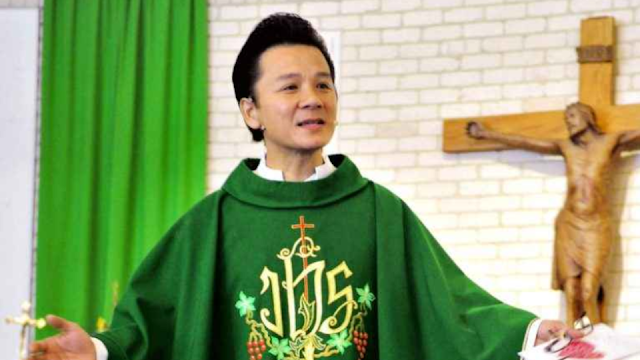 Father Joseph Tran was under investigation for alleged child abuse before he was found dead. Police are urging victims of sexual abuse to come forward in the wake of allegations a high-profile Catholic priest suspected of abusing a young girl for several years, who took his own life. It is understood Father Joseph Tran, who worked as a chaplain at several Catholic Perth schools, died of self-inflicted wounds. He was found dead on Thursday, the same day WA Police launched an investigation of allegations he had abused the girl, who is now 13, over several years. It is understood her mother confronted the priest last week after the alleged abuse came to light but police had not had a chance to question him before he was found dead. The 49-year-old had been the parish priest at Armadale’s St Francis Xavier for the past year after 15 years at Our Lady of the Mission church in Craigie. Hundreds of parishioners attended services at the church. Many were in tears and dozens lined up to sign a book of condolences. “I made sure we checked through all of our files in our office, in the professional standards office and the Catholic education and there’s never been any other complaints,” Archbishop Costelloe said. Following the sudden death of Fr Joseph Tran, and reports in the media that Fr Tran took his own life after being confronted by accusations of his sexual abuse of a young girl, many questions have been put to me about the circumstances surrounding this tragedy. Late on Thursday evening, I received a text message from the Vicar General of the Archdiocese asking me to contact him urgently. I rang him immediately. The Vicar General informed me that Fr Tran had died earlier that day and that it appeared he may have taken his own life after being confronted by allegations of the sexual abuse of a young teenage girl. I did not know at that time who had confronted him - the police, the complainant's family or someone else - but I was informed that the police had been at the Armadale presbytery at some time during the day and had searched Fr Tran's room. My understanding now is that this took place after Fr Tran's body had been found. My immediate concern was Fr Tran's family. I was assured that they would be informed that night by the police. I am not sure if this was done. On Friday morning Auxiliary Bishop, Donald Sproxton, went to the Armadale parish to provide support to the assistant priest and to the parish and school communities. After informing the staff in my own office of Fr Tran's death, I went to the Whitford parish to provide what support I could there. Because the facts surrounding this tragic event were not clear to me at that time, we simply informed people that Fr Tran had died suddenly the day before and that we presumed his death would be investigated by the Coroner, which is the normal practice in these circumstances. I was not seeking to hide anything. I could not share information which I had not yet been able to verify. I instructed that a search of our files be made to ascertain if there had ever been any complaints of this kind against Fr Tran before. Nothing was found. I requested our Professional Standards Office to do the same. Again, nothing was found. I contacted the Catholic Education Authorities to ascertain if they had also received any complaints. They assured me that there was nothing in their files. The first I heard of the allegation against Fr Tran was after I was informed of his death. The police have never contacted me about these allegations; I presume this is because they had just begun their investigations. The policy of the Archdiocese of Perth is that any complaints of sexual abuse are best dealt with by the police. The family of the young girl involved have done the right thing in ensuring this matter was investigated by the police. Had we been contacted by the police we would have cooperated fully, as we always do. Had the family contacted us, our Professional Standards Office would have advised them to go to the police and would have offered any assistance required to help them do so. Any incidents of sexual abuse by clergy, religious or other Church workers are terrible, destructive crimes. The Church in the Archdiocese of Perth has very clear protocols and procedures for dealing with these matters, and we follow them. This news is heart-breaking for everyone involved. The young girl who with her family found the courage to go to the police must be supported in every way, and the Archdiocese stands ready to help in whatever way we can. Fr Tran's family will be devastated by his death and horrified by the circumstances. They are a family of strong faith and they will be supported by the Vietnamese Catholic community and the wider Catholic community. The parish communities of Armadale and Whitford, and the school communities with which Fr Tran was involved, will be especially dismayed and disoriented following this news. Fr Tran was much loved and greatly respected. The clergy of the Archdiocese, already suffering so much because of the terrible sexual abuse crisis in the Church, will struggle to know how to manage their own shock and disappointment while trying to provide what support they can for their people. I wish to reiterate once again that I would encourage anyone with a complaint of sexual abuse by any member of the Catholic Church to go to the police. If someone needs assistance in doing so, the Director and staff of our Professional Standards Office are ready and willing to help. All complaints which come to the Archdiocese are dealt with in an objective, independent, professional and compassionate manner by the Professional Standards Office with no interference from the Office of the Archbishop. The sexual abuse of the young is a serious and terrible crime. When perpetrated by someone representing the Church, it is also a shocking betrayal of trust. It goes against everything the Church proclaims. I remain committed to doing everything I can to eradicate this evil from the Church in this Archdiocese. Married men abuse their daughters. Abuse of minors is not a sexual problem solved by marriage. It’s a human problem solved by correct treatment, confession, and practice of virtue of chastity.